The situation near Standing Rock is getting more and more desperate, with Energy Transfer Partners committed to finish drilling under the Missouri before year’s end, and the U.S. Army Corps of Engineers issuing what amounts to an eviction order for those at the Water Protectors’ main camp. We need to talk to friends and family, and to our political and religious leaders, to stop the violence, stop the pipeline, and to Stand Up for Standing Rock. Here are a couple of visuals to help you get some of the main point across quickly. A proposed pipeline route that originally crossed under the Missouri River near the majority white city of Bismarck, but was rejected in part due to citizen concerns about the threat to their drinking water. 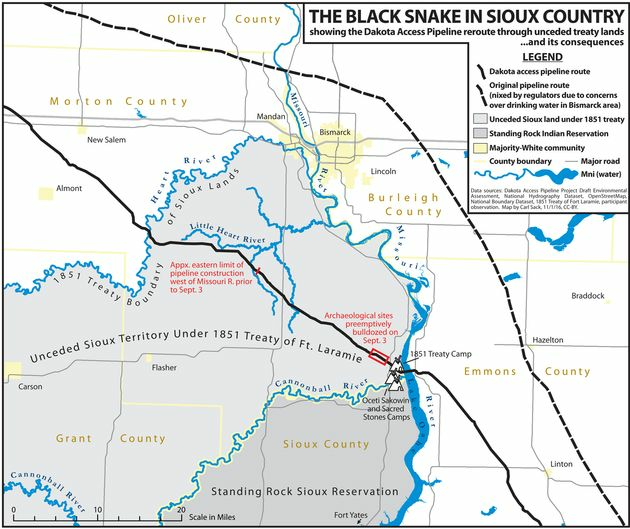 The current pipeline route that crosses the unceded Sioux Territory from the (broken) 1851 Treaty of Fort Laramie. Tool Box Item #2: Here is a 90-second video from the Nov. 20 confrontation between law enforcement and Water Protectors near Standing Rock. It is something you can share with friends and family; it is shorter and better produced than much of the uncut video available on line. This confrontation happened on a bridge on a highway north of Oceti Sakowin, the main Water Protectors camp, which is on federal land. The U.S. Army Corps of Engineers is now pulling the camp’s permit, telling people to leave by Dec. 5 or face trespass charges. Here are some questions to pose from the video: Who is endangering public safety, law enforcement or the Water Protectors? Where is the video showing the threat coming from the Water Protectors? This public safety challenge has been going on for months. Where are the federal mediators or monitors? Why not talk to the Morton County Sheriff’s Department about reasonable use of force? 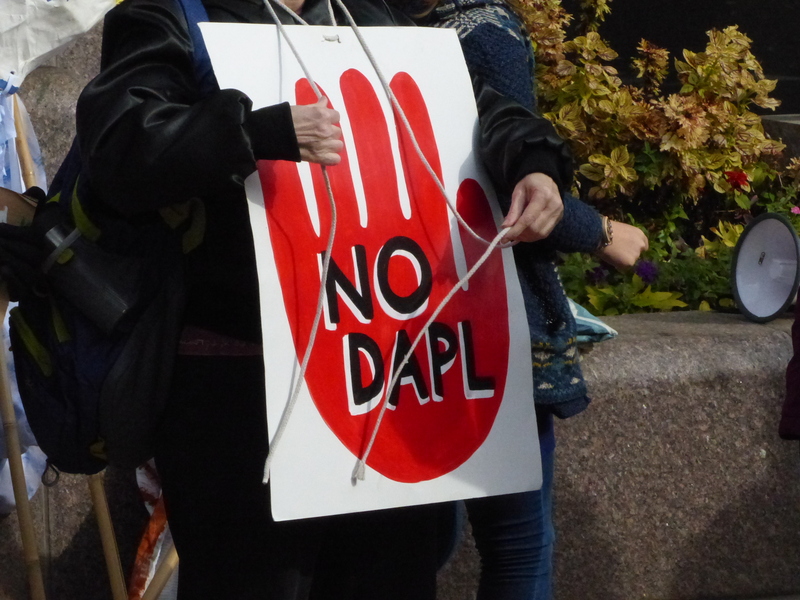 Protests erupted in the Twin Cities when the Hennepin, Anoka, and Washington county sheriffs departments send deputies to North Dakota to support a heavily militarized response to the No DAPL movement. They have since pulled out, but other law enforcement agencies continue to step in. Agents with the U.S. Customs and Border Protection will be the latest agency assisting Morton County Sheriff Department deputies to guard Dakota Access pipeline construction as it prepares to drill under the Missouri River. That’s right, the agency that is supposed to keep people from illegally entering this country is being used against the indigenous peoples who were the first ones here. Yes! Magazine included a recent ACLU list of law enforcement agencies responding to Morton County’s request. There are 75 agencies apparently responding to the mutual assistance request. The list can be found here. Public pressure matters. In addition to the Hennepin County Sheriff’s Department, other departments have declined Morton County’s request for mutual aid, according the article in Yes! Magazine. They include Montana’s Gallatin County and Wisconsin’s Dane County. In a statement Sunday, the Army Corps said it has no plans to forcibly remove protesters, but anyone staying on the camp after that date will be trespassing and subject to prosecution. The Army Corps has offered what it calls a “free speech zone” in a different location that it says is more accessible to emergency vehicles.